Hey everyone! 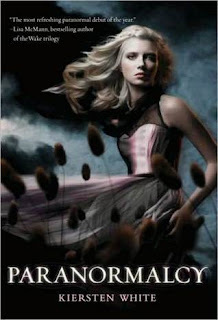 This week I'll be reviewing two books I somehow found time to read in the same week - Paranormalcy by Kiersten White, who has a simple yet inspiring bio you can read here and Pretty When She Dies by Rhiannon Frater who has an awesome blog you can find ... here! Only one of these books are tween friendly, where the other, in my opinion, is for 18 and up! Graphic/sexual content and strong language. That said, let's start with a little something for everyone! My Review: Right off the bat, Evie, main character/narrator, quickly became a favorite of mine. Maybe it's because I have a soft spot for characters whose names begin with E, like mine, because they tend to be rare. It's either that or the fact that she's the kind of gal that's always right smack-dab in the middle of things. It is said that she is the only one of her kind - a human that can see through paranormals' glamours - meaning she can see the rotting corpse beneath the glamour of a handsome vampire, or the glowing yellow eyes of a werewolf behind the color everyone else sees. She's a little nosy and rebellious which works out perfectly for us, because you don't miss a thing! All the action centers around her! Evie just wants to live as normal a life as possible while working for a company run by paranormals, designed to bag and tag other paranormals in efforts to civilize them, in a way. But when Evie discovers she may not be entirely human, the Center where she works and lives, her sanctuary, may not be as safe as she thought or even what she thought. The fairies in this story are sneaky, conniving and talk in rhyme. Translation: they make for a lot of excitement and trouble, especially with their own interpretations of a named command. Enter Reth; fairie, master manipulator, Seelie or Unseelie? Hmm, so hard to tell... He stalks Evie wherever she goes, speaking in riddles about trying to help and filling her but he won't say with what but it glows like golden flames beneath her skin! Evie can't decide if what Reth is doing to her is good or bad, which makes the mystery that is Reth, all the more intriguing. Speaking of mysteries, Lend, prisoner of IPCA, is by far the most interesting character in this book. Maybe save for Alisha, Evie's BFF and mermaid. However, Lend can change form to look like anyone he wants. His true identity, his normal paranormal self, the part only Evie can see no matter what, appears made of water, his skin smooth and soft to the touch. I am so in love with this book because it easily played out like a movie in my head. Everything about everything grabs your attention. I honestly did not focus on scenery too much while reading this. I don't think it was because the descriptions were weak, rather he story was so interesting I didn't really care where they were, I just wanted to know what was going to happen next! I was excited the whole time, shaking my head like "This book is crazy!" It was light, fun, and addictive. Yet, there is one small, teeny-tiny thing I could have done without. There was...a lot of vampire bashing. Evie just can't get past the corpse under the glamour so they really gross her out. I try not to think about it that way. Call it shallow, but the vamps in my favorite movies and books are pretty hot and I'd like to keep it that way! Who Should Read This Book: One size fits all. Fun for all ages. Tell your friends about it. Begin the slow and painful wait for Supernaturally, Paranormalcy #2! Synopsis: Amaliya wakes under the forest floor, disoriented, famished and confused. She digs out of the shallow grave and realizes she is hungry in a new, horrific, unimaginable way. Sating her great hunger, she discovers that she is now a vampire, the bloodthirsty creature of legend. She has no choice but to flee from her old life and travels across Texas hoping to escape her creator. How I Came To Read This: This book was on my to-read list but I never picked it up at the store. After I got my Nook and started browsing for ebooks, I came across Pretty When She Dies and downloaded it immediately. Once I started the first chapter, I was hooked. My Review: It begins with a young woman who doesn't where she is, how she got there, what happened or even her name. Waking up underground, buried, to be more specific, she is led by her instincts rather than her memories to not only dig herself out of her grave but back to her college campus, to her room and all the way to her first meal. All along the way you feel as though this is happening to you. This scene (as well as the rest of the book) is so descriptive of her feelings, her actions...everything it's as if Frater was recapping an actual event she personally was a witness to. Or it happened to her friend. The story was so captivating, so good at holding you in suspense. Poor Amaliya. She can't catch a friggin' break. The guy she has a crush on killed her. If that wasn't bad enough, he turned her into a vampire. That's the kind of thing you have to ask a lady about first! When her maker throws her out into the world without any lessons on how to be a vampire, she hits the road. Badass style. Looking for another one of her kind. Someone who isn't her jerk creator. She learns some hard lessons along the way but each one makes her stronger and stronger. She's no ordinary vamp! However, she doesn't find another one of her kind - he finds her! Cian. If you're having a hard time pronouncing that name, like I did for many, many pages, it sounds like Key-Inn. Whatever his names is or sounds like, I love him. I think each character had just enough background story to make them significant enough to care about them but not enough outshine Amaliya and Cian. I enjoyed the dry humor, the real feel of the story - to a certain extent of course, it is a paranormal horror story! Full of edge-of-your-seat action and scenes that draw you in so much that at the end of it, you realize your nose is touching the book..err, screen, in my case. I really like the cover, too. I feel the girl really resembles Amaliya and it provided a great basic visual to get you started and at times, I pictured her looking exactly like that! I must warn you: reading this book may result in slight heartbreak or major heartbreak, if you're me. 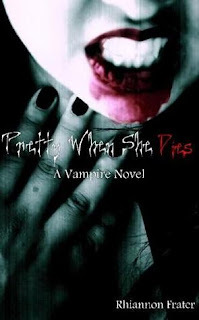 I was lucky enough to correspond with the author, Rhiannon Frater, who so kindly informed me that the other two books of this trilogy, Pretty When She Kills and Pretty When She Destroys have been put on hold while she is busy reissuing As the World Dies: A Zombie Trilogy. Who Should Read This Book: This was a mature vampire story, in my opinion. A change from high school drama and parents getting in the way of all the fun. I think this book might be a little overlooked and I believe it is worth a closer look. Thank you for the great review. I hope you will enjoy my other vampire novel, THE TALE OF THE VAMPIRE BRIDE (available in ebook and paperback) and enjoy my zombies series when the first book, THE FIRST DAYS, is released by Tor on July 5, 2011. Thank you Rhiannon for the great book! I really enjoyed your writing style and will definitely be checking your other books!